Modern amenities like air-conditioning, TV, etc. A beachfront property on Lipa Noi beach, Samui, Baan Chom Tawan is a six-bedroom resort-style home with expansive lawns, easy access to the beach, private swimming pool, and ample living spaces for guests to thoroughly enjoy themselves. 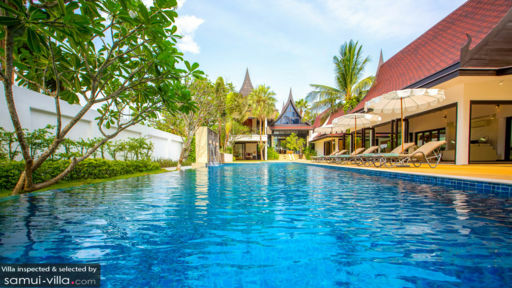 Beside the naturally rich surroundings, the villa itself is a traditional Thai home wired with modern comforts such as air-conditioning, wi-fi, DVD players, and TVs. The location of the villa is unbeatable and so is the comfort and luxury afforded by its interiors. Lounge on the poolside sala or the terrace where a chilled cocktail under the sun would go a long way! 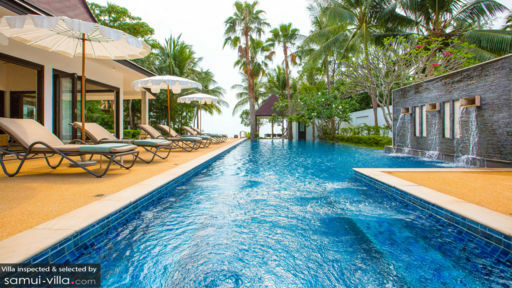 Baan Chom Tawan boasts of six bedrooms that are found around the property, some of which offer splendid sea views while other have garden or pool access. Each bedroom is well-furnished and features a common tangerine décor for a more vibrant setting. Guests can stay in one of the five king-bedded rooms and the sixth bedroom is furnished with twin beds which would be ideal if you’re travelling with children! There are several amenities in all the bedrooms including air-conditioning, TVs, wardrobe, and an indoor lounge. With en-suite bathrooms to make your life easier, you have absolutely nothing to worry about. There are shower and/or bathtubs in each bathroom, as well as other amenities. Supported by a gorgeous water feature, the massive mosaic-tiled swimming pool is like an oasis in the desert with its rippling, cool water waiting for you to take a dive right in! The comfortable sun chairs that are placed on the deck have parasols to shade you from excess sunlight creating the ideal ambiance for a well-deserved afternoon nap. There is a covered terrace from where you can enjoy the view and a little further is the sala which comprises a BBQ, outdoor dining, and the endless ocean! With glass doors that lead to and from the deck, the main living pavilion at Baan Chom Tawan is a homely space furnished with comfortable sofas with ceiling fans overhead to keep the space airy and breezy throughout. In order for guests to make the most of these abundant and luscious surroundings, the open-plan layout helps to keep you in touch with nature. Fitted with a flat-screen TV and DVD player, there is entertainment as well so you can kick back and put your feet up. The living room is air-conditioned so you can do temperature control however you wish. A high-pitched Thai ceiling gives the living room a traditional touch while the modern comforts make it easier for guests to settle in. The dining area indoors is perfect for a more formal setup, unless you wish to dine beside the crashing waves of the ocean! 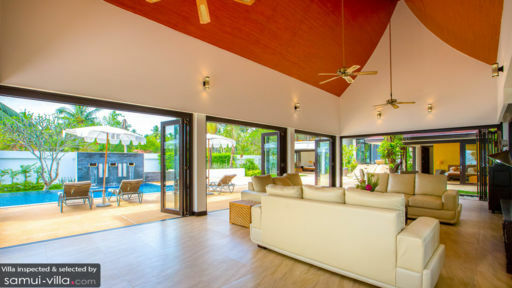 To take care of your dietary needs, the villa is equipped with a western kitchen that has been fitted with state of the art equipment as well as a breakfast bar with stools. The villa provides the utmost comfort to its guests with an English-speaking manager to look after everyone’s needs. There are housekeepers and security, attendants to maintain the property. There is even a wine cellar with a wide selection of house wines that guests can scour through and if you wish, hire a personal chef to make the most scrumptious meals to compliment the flavour of that wine! Located right on the beach, Baan Chom Tawan is an idyllic destination for the most rewarding tropical vacation with friends and family. There are many popular restaurants and bars just a short drive from the villa and you can always take a leap of faith and indulge in several water activities!